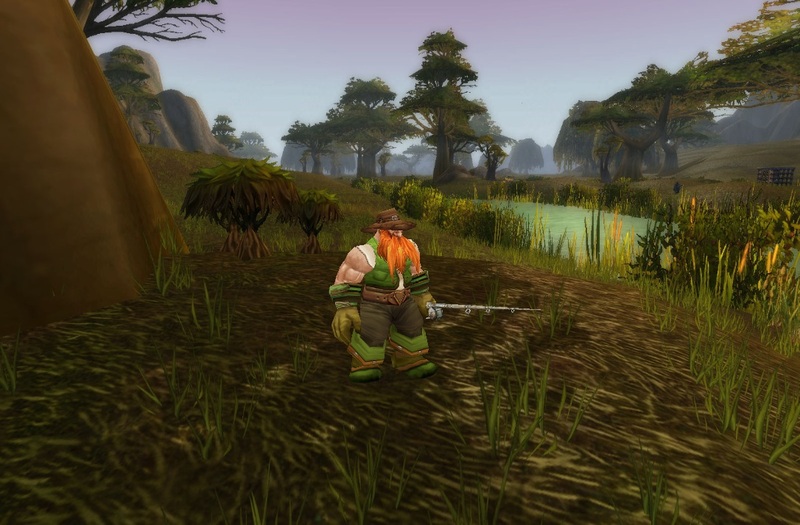 The World of Warcraft: Cataclysm have wrecked havoc on a lot of our favorite places in the Eastern Kingdoms. These outfits are to represent the Old Azeroth as it was, almost a sort of tribute to those zones that have been destroyed for good. Most of these outfits can be worn for other zones, as well; and not necessarily only in the Eastern Kingdoms. I only focused on the zones I felt will be most impacted by Cataclysm, but, I will probably come back and add more later…maybe even for some of the new zones that will pop up ^_^. This was just a simple outfit I threw on Lafaunda while she visited the park for the last time. …and there was a beautiful water feature, as well. 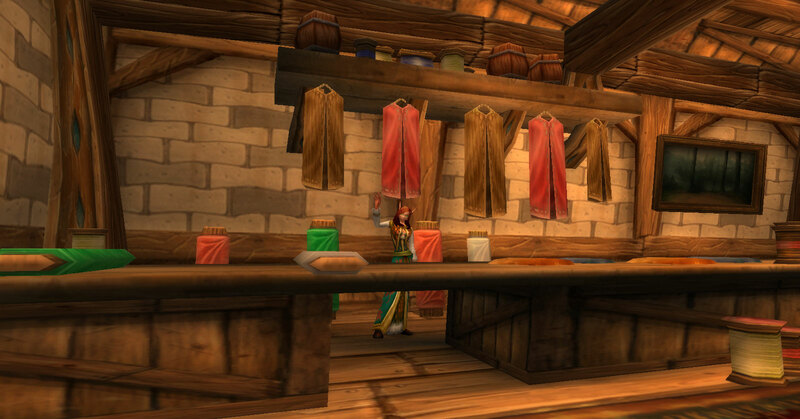 There were a lot of empty shops, and a nice big empty tavern, that supported all kinds of role-play. 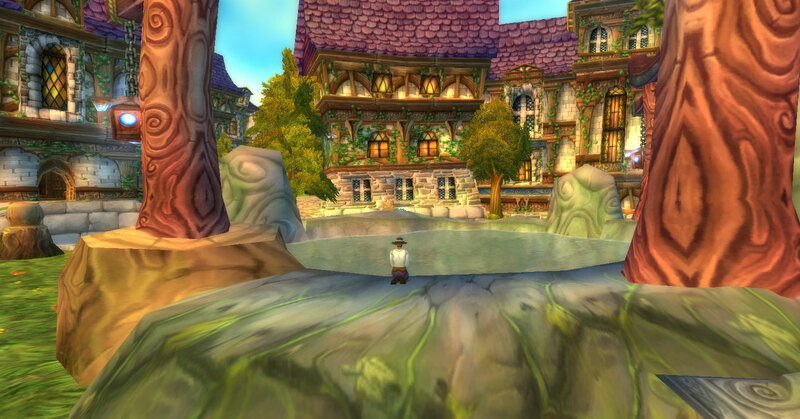 But, even though The Park is now gone, Stormwind City has quite a few other “empty” places players can call their own. 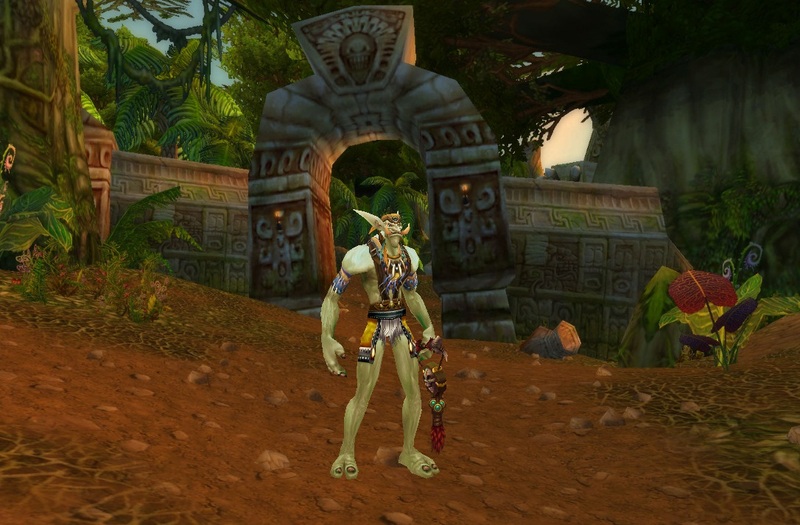 Even though it is now two separate zones, Stranglethorn has not lost its jungle adventure flavor. There can be two types of outfits to reflect this zone(s). Of course, the main one is the “jungle” primitive outfits to fit in with the voodoo Troll tribes and ruins found amongst the zone. Any type of armor that reflects this can be used, and there are lots more than what I have listed. Remember, less is more with these outfits, and try to add as much contrasting colors as you can; maybe even different animal prints. Instead of the loincloth look, robes like the Sage’s Robe can bring that same style of the Stormcloth Vest, only more…civilized. It should also be noted that the Stormcloth Vest is no longer available to learn by players, but, maybe an old tailoring friend has the pattern for it. This is one of those types of outfits were having foot-ware like Ringo’s Blizzard Boots or the Shimmering Geta really take it to a whole new level. I incorporated some of the jungle outfits’ pieces to give the tourist outfits the feeling that the visitor shopped for “handmade” wares and are now wearing them during their stay. 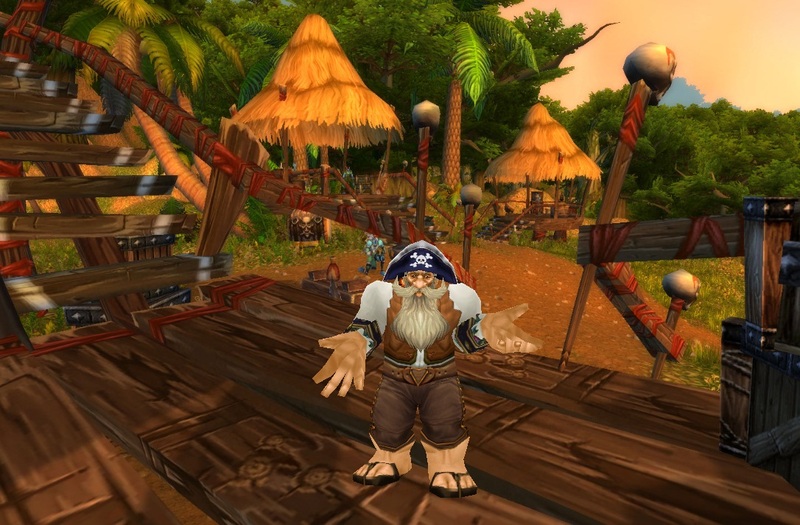 Pirate accents, like the First Mate Hat used above, or any of the many eye patches in-game can also be brought into the outfits because everyone loves the Bloodsail Pirates that still wander around the shores of Stranglethorn. 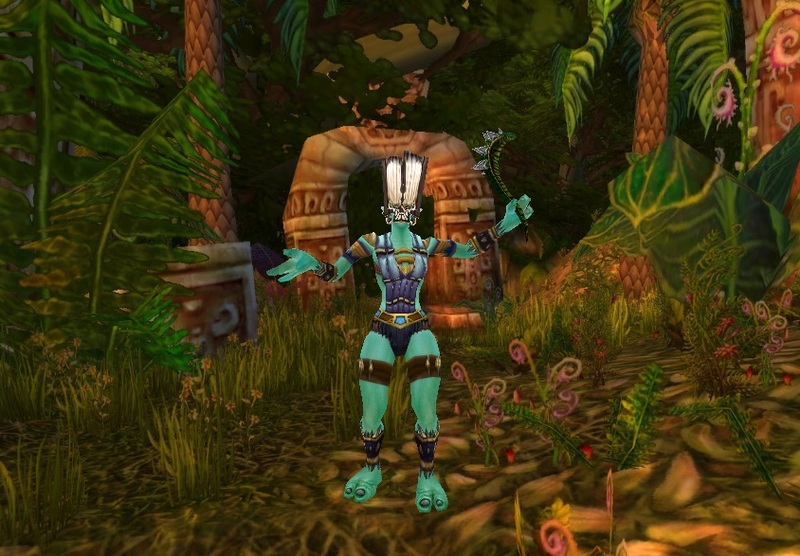 You also want to keep your “visiting Stranglethorn” outfits simple and light to stay cool in the humid jungles; take a look at the Summer Outfits article for more ideas (which also has screenshots of classic STV). To have a more STV hunter outfit, maybe some of the leather-working outfits in the Workman article can give you some ideas. Just substitute the knife for a gun of your choice. 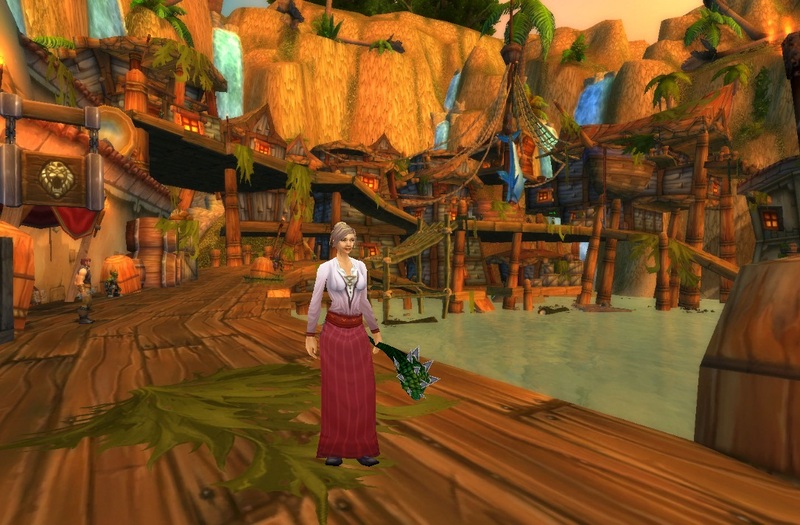 The more primitive of these outfits can also be worn when visiting the Trolls’ Sen’jin Village. 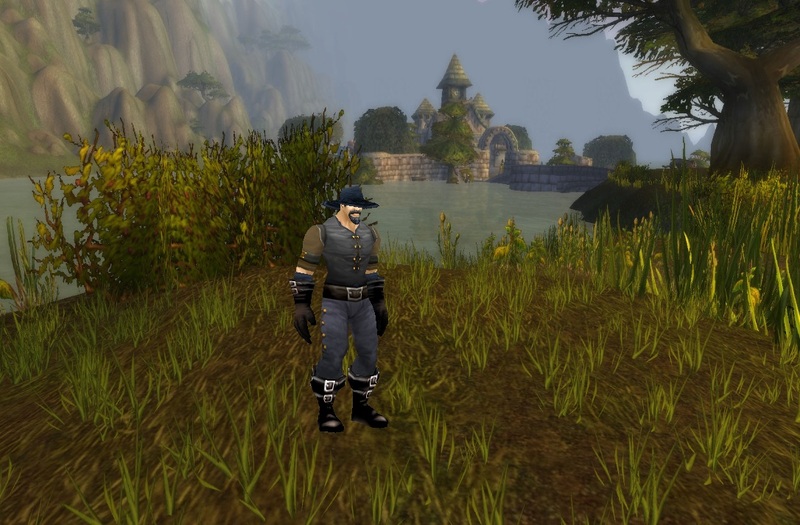 While leveling my new Alliance paladin, I was inevitably led to Westfall to continue my questing there. 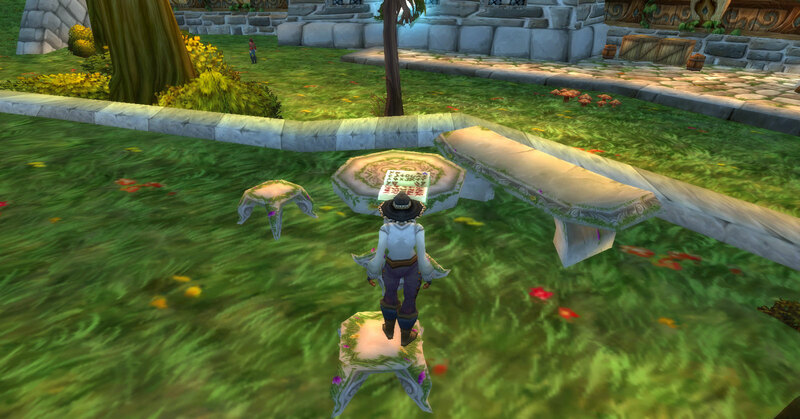 I remember the classic Westfall quests when leveling there before. The only real issues the “good people” of the zone had to deal with were the Defias gang, which, meh, okay, were a problem. But now, the whole simple, good-hearted spirit of the people, quests, and the zones seems to have disappeared along with the Defias pests. The quests now reflect that of famine and murder…too much reality for a computer game in my opinion, lol. 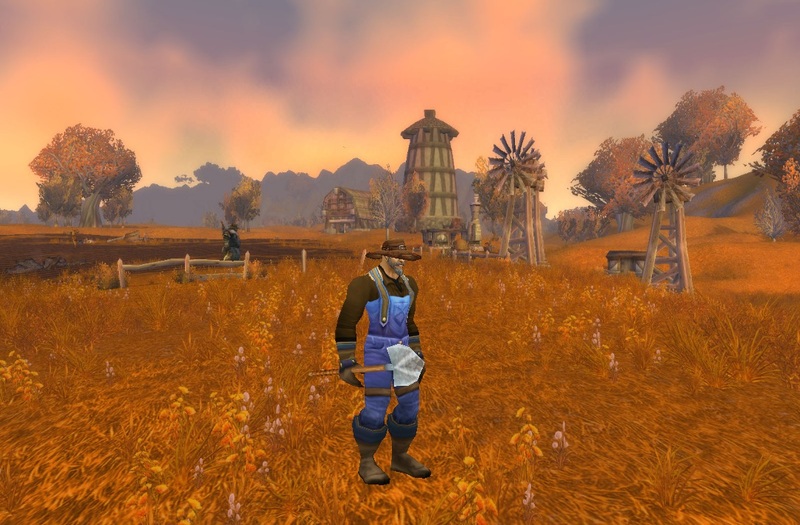 I hope that these outfits capture the spirit of what Westfall was: simple, hard-working, and will-full. When making a Westfall outfit of your own, do not try to be too elaborate. I also stayed in a very “dull” color range to stay with the golden hills and gray dirt of the zone, kind of like in the original Wizard of Oz movie when everything was brown/white in Kansas. One of the two items I farmed for before The Shattering hit because I feared they would no longer be in game, was the Master Builder’s Shirt (the other was the Sawbones Shirt…it took me about 3 runs to get each of them). All was in vain, however, as both shirts are still in-game. But, I feel the Master Builder’s Shirt compliments the Unkempt Robe beautifully, though, the Common Gray Shirt is still a great alternative. There is not much to say about this outfit other than farming outfits are definitely the way to go for Westfall-like outfits. More alternatives can be seen in the Workman article, or continue to the next outfit ^_^ . Can’t equip 2-handed maces like Kirina? 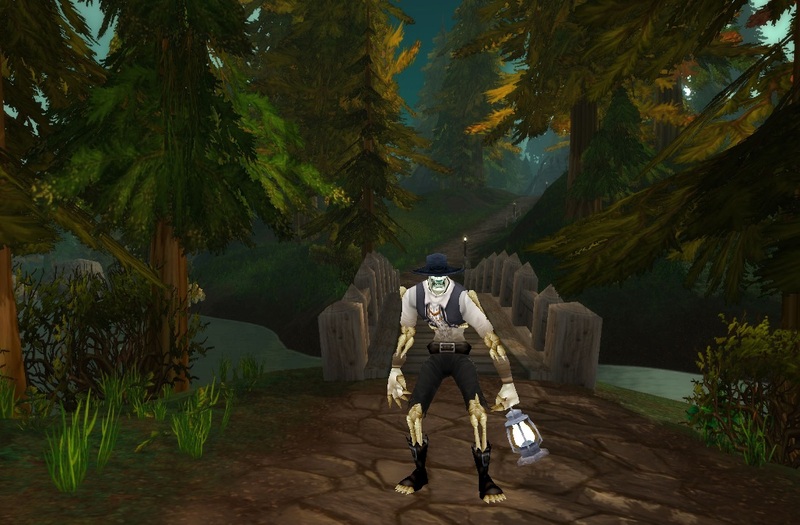 Cataclysm brings the Shovel of Mercy for us one handers….that is…if you are an Undead Priest ~_~ . Bah! But, maybe more like it will come out later…possibly even a pitchfork off-hand frill? Who knows…. This outfit is a prime example of “matching with the background”. I tried to stay in the golden-brown range of colors that are only highlighted by Westfalls earthy beauty. 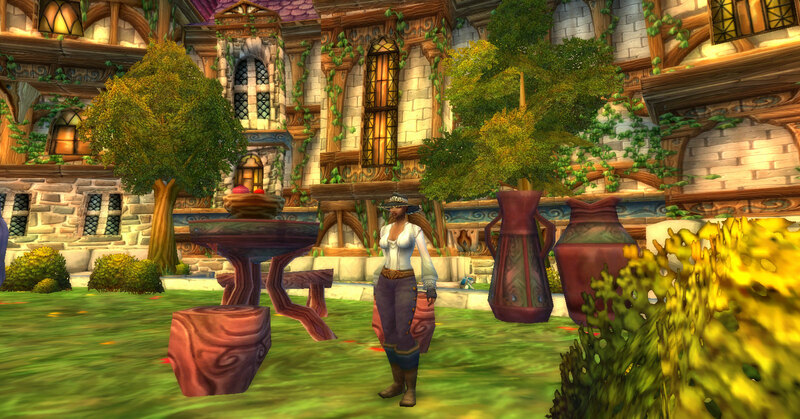 I do not know where else these outfits could fit in around Azeroth….maybe for the Alliance side of Arathi Highlands. 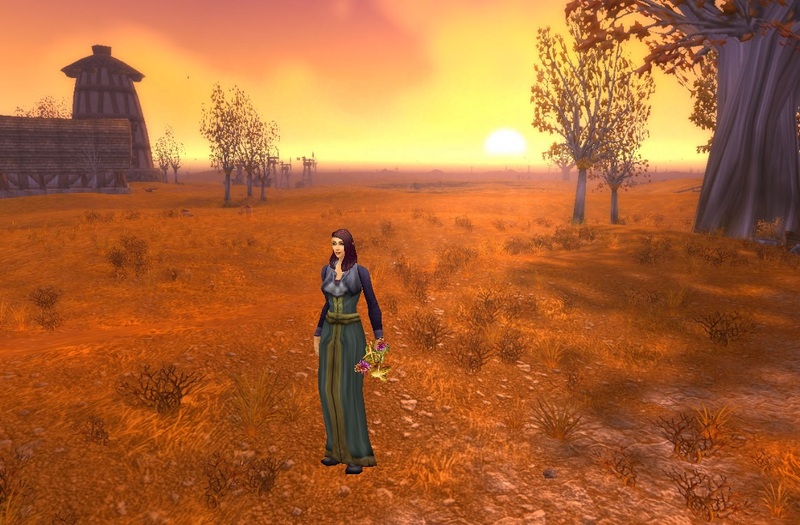 I feel that they are more for Westfall only, since its spirit has been devastated greatly. A possible color schemes for this outfit is: dark, but not too dark. LoL, what does that mean, Kirina? I stayed with dark blues, greens, and the occasional black, but also tried to still soften the look (the zones aren’t that gloomy). For Forsaken characters, I like to focus on already tattered clothing, which becomes more tattered on their bodies. A more Human-like outfit…possibly worn when he was buried? The Shadow Council Tunic has dirty looking sleeves, and the other fancy items, like the Haliscan Pantaloons, become a ragged memory of what the pants were long ago. I added the Eerie Stable Lantern because, well, it’s eerie…and when walking at night in the zone, it definetly gives off an ominous glow. The Mystic Set is one of those sets where just about every piece is torn in some way. An easier-to-get alternative (for Horde) would be the Tattered Cloth set; however, I chose to stay with the Mystic pieces because of their darker blue accents, which match the Undercity Doublet better. 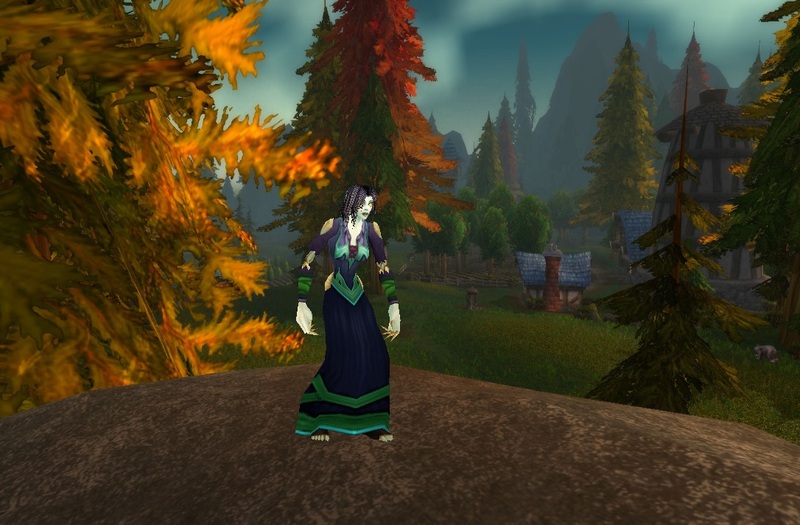 While this robe is dropped off of spiders in Tirisfal Glades, it is still a very nice Hillsbrad outfit alternative. Once again, the Master Builder’s Shirt adds that extra touch of flair. 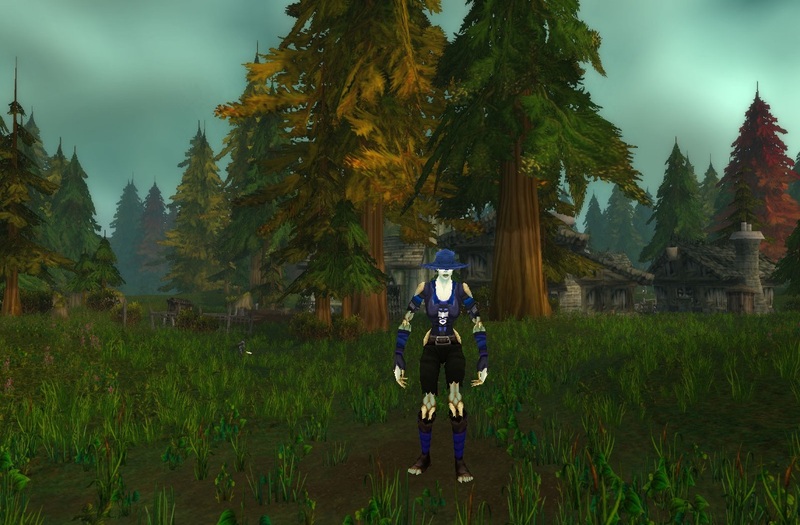 Any of these outfits can be worn in other places, such as Tirisfal Glades, Silverpine Forest, or even in Northerned around Vengence Landing in the Howling Fjord. . So, The Wetlands was not as destroyed as I thought. But, I still wanted to make outfits for it due to their versatility in other places. The Wetlands sort of remind me of the swamps around Florida and Louisiana. Because of this, the armor I chose to focus on in these outfits are thick leather (especially for boots) and cloth (easier to move around in and won’t rust like mail and plate) in green/brown colors that match the swampy environment. I also stayed away from robe alternatives to go along with walking-through-a-swamp theme. The brilliant red/orange hues in this outfit are stylish and they brighten your character away from the surroundings. The overall outfit, however, still plays in to the part with tromping around in muddy areas with the Tracker’s Boots. This is another example of a “swampy” outfit. The Seawolf Gloves were a neutral quest reward from some pirates out in Arathi Highlands, but, sadly, are not in-game anymore. Any other leather or heavy cloth gloves will due, especially if they have green “algae” like accents to it. Okay, okay. I know I veered away from the “green and brown” scheme, but, I still thought this was a nice Wetlands alternative. I thought this would be a good Menethil Harbor “dock master” outfit. He definitely stands out from the scenery, but it is still functional. 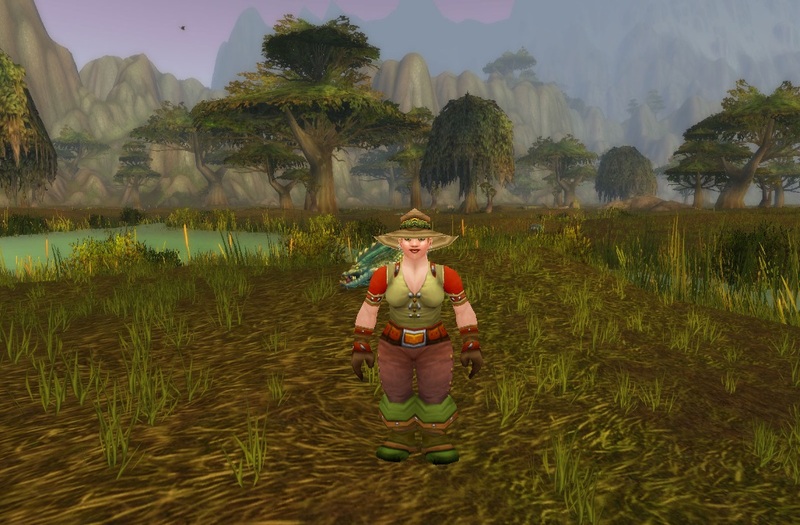 I figure these outfits could be worn in Swamp of Sorrows, Dustwallow Marsh, and maybe even Loch Modan (like the first one with more color). 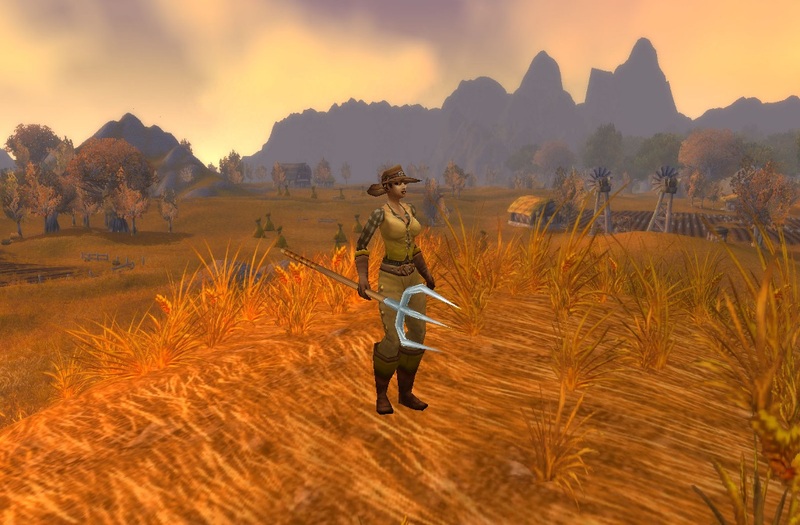 The zone-change information listed in this article was taken from: WoWWiki – WoW Cataclysm article..